It made sense. At the helm of the animal research industry’s most ill-famed primate supply company, Matt Block had his enemies. But the author of the letter wasn’t an animal rights extremist—it was Block himself. As he would later admit in court, the death threat hoax was part of an elaborate plot to frame the grassroots organization campaigning to put him out of business: South Florida Smash HLS. A rabbit winces as drain cleaner is dripped onto her cornea. A beagle vomits after another force-feeding of mystery drugs. A caged macaque monkey, rocking back and forth, picks obsessively at the contraption screwed into his skull. These images seem too unjust and heartbreaking even for nightmares. Yet the horrors of animal experimentation couldn’t be more real: Every day, nonhumans are injected with toxic chemicals, addicted to narcotics, irradiated, psychologically tormented, electrically probed, starved, mutilated, and killed under the guise of scientific research. Their lives, mere commodities in the eyes of capitalism, are burdened with anguish at every turn and then snuffed out for profit—all on an inconceivably large scale. Some call it a sad fact of life, one that just has to be accepted. We disagree. As UK activists demonstrated in the ’90s and early 2000s, challenging the vivisection industry can be fruitful when done right. An unprecedented surge of grassroots campaigns left numerous animal breeding facilities throughout England disused in its wake, and that was only the beginning. The momentum carried over into the US with Stop Huntingdon Animal Cruelty (SHAC), a campaign so hard-hitting it brought the largest animal testing laboratory in Europe—Huntingdon Life Sciences (HLS)—to its knees. It was out of the embers of the international SHAC campaign that South Florida Smash HLS was born. Founded in May 2010, Smash HLS set out to energize the area with something new, something with longterm focus and strategic goals—a campaign that could gain momentum and effect concrete, measurable change for animals in labs. A campaign that could not only stand morally opposed to vivisection, but disrupt the very infrastructure that made it possible. We were in the right place since South Florida, an epicenter for US primate breeders and importers, was home to a company that supplied monkeys to the notorious HLS. Alongside friends from Everglades Earth First! and Fort Lauderdale Food Not Bombs, we got to work. On its website, Primate Products, Inc. (PPI) boasted an exhaustive catalog of all things monkey torture: cages, restraint chairs, collars and poles, so-called enrichment toys, training workshops, blood, organs, and, of course, living primates. Whether you were a pharmaceutical company or the US military, PPI had you covered. In person, it was less showy: There was no sign, not even a logo. Just a drab warehouse building surrounded by auto body shops in industrial Doral, Florida. Minutes from Miami International Airport, it was here that the company would quarantine newly imported monkeys for 30 days before trekking them to its outdoor breeding site a couple hours west. 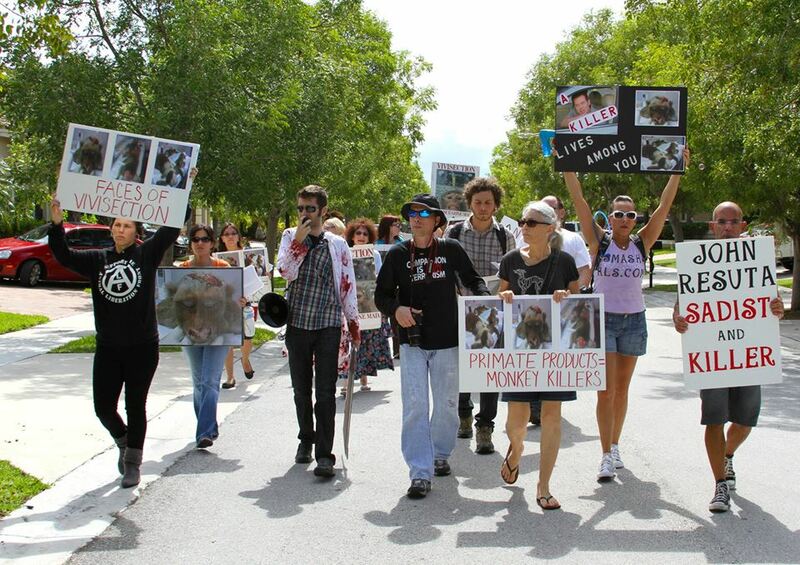 On May 17, 2010, a ragtag group of nine gathered outside the facility to speak up for the defenseless animals imprisoned inside. With nothing but cardboard signs and impassioned hearts, we shamed the company’s staff and flooded the streets with animal liberation chants. Workers on the block, long nauseated by the putrid stench emanating from the mysterious building, finally understood its tragic source. They at last knew about the death machine that was Primate Products. But this wasn’t just about educating the community or calling for a boycott. We were out to confront the individuals who kept PPI in operation—to hold them personally accountable for the blood on their hands and give them reason to rethink their jobs. As the protest wound down, we were met by then-president Don Bradford, who we would later learn bragged that his primate victims were “good to the last drop.” It was a phrase elaborated upon in harrowing detail throughout the company’s Standard Operating Procedures, which described PPI’s practice of harvesting every fluid, organ, and tissue imaginable from macaque monkeys. Cigar in hand, Bradford pompously tried to smooth things over by explaining that laboratories had to buy primates from someone, and it might as well be him. Nice try, Don. So we returned. Then again. And again. And again. We kept coming back, our numbers swelling over time. Pretty soon we were showing up unannounced, day and night, multiple times a week. Sweltering heat or pouring rain, we would be there to amplify the screams of PPI’s victims. In September 2010, when leaked photos of neglected, injured primates made their rounds in the local news, more than 50 people attended a protest at the facility. In just a few short months, South Florida Smash HLS had become a force to be reckoned with. 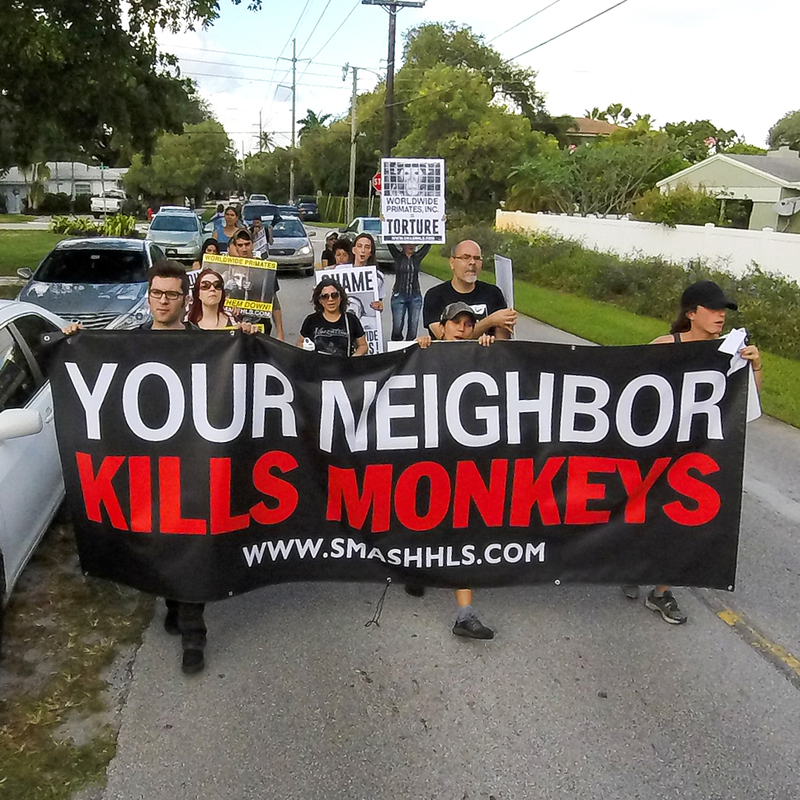 Protesters outside the Primate Products facility confront operations manager John Resuta. To avoid inbreeding and to offer a wider selection to their customers, suppliers like PPI have historically relied on airlines to source nonhuman primates from around the globe (mostly from China, Southeast Asia, Mauritius, and the Caribbean). Along with the Animal Rights Foundation of Florida (ARFF) and the international Gateway to Hell campaign, we paid special attention to that reliance. 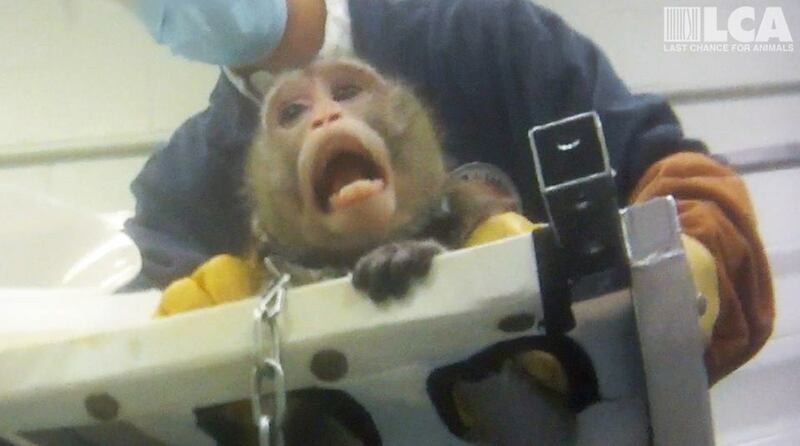 In October 2010, Smash HLS got word from activists in the UK that Amerijet, a Florida-based airline, had been taking part in the cruel primate trade. Sure enough, Amerijet was transporting wild-caught vervet monkeys to Miami from the Caribbean island nation of St. Kitts and Nevis for none other than Primate Products. In no time we were outside the airline’s Fort Lauderdale headquarters with megaphones blaring. While allies in England, France, and Germany protested one of Amerijet’s top financial backers, we kept pressure on the airline at home. The protests got more frequent, and each time our demand was uncompromising: Stop flying primates to their deaths or continue to hear from us! Increasingly bothered, the airline began hiring off-duty cops in hopes of quelling our presence. No use. Even when the founder of Smash HLS was arrested on bogus charges outside the headquarters, the campaign only escalated—a nighttime protest was held outside the home of Amerijet’s vice president. But they wouldn’t cave just yet. In a lengthy letter to ARFF, Amerijet CEO David Bassett doubled down on his decision to continue flying monkeys for the vivisection industry, claiming the airline would not be deterred by “harassment or intimidation” from activists. Then, on February 12, 2011, after learning that Bassett’s wife was a motivational speaker with a reputation to uphold, we spotlighted her connection to animal murder on the Smash HLS website—and Amerijet suddenly changed its tune. On Valentine’s Day, the company announced that it would no longer transport nonhuman primates for any purpose. Next we contacted Caribbean Airlines, which hardly put up a fight after hearing about the Amerijet campaign. Then IBC Airways, another Fort Lauderdale-based airline—they too agreed to stop shipping primates, after just two hours of attention. Then, following personal visits and a barrage of calls, emails, and faxes, Monarch Air Group also gave in. Choice Airways was next. And finally, Laparkan Airways. Florida wasn’t alone: One airline at a time, the global primate trade’s transportation infrastructure was coming undone thanks to grassroots pressure. What was once a rolodex packed with commercial airlines willing to fly monkeys to laboratories dwindled to just one or two known offenders. People power in action. Critical as it was to disrupting PPI’s operations, the airline angle was one of many. Primate Products was a weak link in the vivisection industry, and the company had its own weak points. Wherever we found a crack, we dug our hands in and pried. If we learned something sensitive about the company, we followed through. We didn’t let up. In November 2011, our friends at ARFF obtained records detailing a year’s worth of PPI’s imports and customers. Together we coordinated email and phone actions that soon had their customers’ inboxes inundated with complaints from outraged people the world over. Solidarity actions started cropping up around the country, with conference disruptions and office protests taking place against PPI’s customers in California, Michigan, New Jersey, and Maryland. Activists of all ages and backgrounds did whatever they could to support the campaign—from making polite phone calls and submitting petitions, to writing songs and making art, to blockading the entrance of PPI’s breeding farm with concrete and tar in the middle of the night. The creativity was flowing faster than PPI’s blood money! The blockade and vandalism at PPI’s breeding farm clearly inspired language in the death threat Matt Block wrote to himself. We didn’t stop at pressuring the company’s financial ties. We got personal, too. It started with a demonstration outside Don Bradford’s gated community. Then, his private golf club. Pretty soon dozens of activists were showing up on his front lawn, bypassing the gate (once with a sympathetic neighbor who shuttled us in and another time thanks to an oblivious security guard). A far cry from the smug businessman who confronted us in Doral, monkey-killer Don was soon cowering in his home and praying for the protests to stop. Executives and employees alike were given the Smash treatment. Apart from posting their photos, names, addresses, phone numbers, email addresses, and license plates online, we made in-person appearances a staple of the campaign. Primate Products’ head veterinarian took her share of the shame: Activists called her over 500 times in one month, blasted the cries of lab monkeys through a 2,000-yard-range megaphone in front of her house, and even contacted and shared information about the nursery where her husband was employed. Activists march in the neighborhood of PPI’s operations manager in 2012. In April 2012, operations manager John Resuta got a taste. At times numbering upwards of 60 protesters, Smash HLS demonstrated outside his home over fourteen times. Wielding signs plastered with graphic photos of the animals mutilated on John’s watch, activists marched through his neighborhood by day and shined flashlights through his bedroom window by night. On one occasion, John’s wife was so startled to see us that she sped out of the neighborhood in reverse! We made it our mission to corrode PPI’s morale and dignity at every turn, just as they did to the nonhumans whose violated bodies funded their lavish lives. And it worked: The pressure had PPI’s staff wearing disguises, obscuring their license plates, and eventually leaving the company altogether to avoid attention from Smash. Bit by bit, Primate Products was crumbling. In one six-month period, several key executives and employees quit, including the Vice President/Chief Operating Officer, the Director of Bio-Resources, and the company’s Behaviorist. Along with other pressures from our campaign, the exodus would soon spell the end for PPI’s quarantine site in Doral. In June 2013, after weeks of speculation, we learned that our persistence had paid off. The facility, which for decades served as a hellhole for countless animals, was finally shutting down! By compounding PPI’s costs and constricting their benefits for three solid years, we successfully tipped the scales in the animals’ favor. We drove the killers out. A few months before our PPI win, the founder of a competing supply company called Worldwide Primates (WWP) invited all the local animal dealers and their security staff to a meeting. It was a call to arms—an attempt to coordinate a response to intensifying pressure from activist groups like Smash. Presumably, he saw the writing on the wall and feared we might take aim at his business after knocking out PPI. That man was Matthew Block, the same guy who would later get busted for mailing fake anthrax to his own deceased mother and an employee in an attempt to frame Smash HLS. His track record made even Primate Products look wholesome: a botched shipment of 110 dead-on-arrival monkeys from Indonesia, thirteen months in federal prison for smuggling endangered baby orangutans (the infamous Bangkok Six case), and numerous violations of the Animal Welfare Act. Having founded WWP as a teenager in 1980, Block was unusually committed to monkey mutilation. It would take a heck of a lot more than pleading to put him out of business, but we were up for the challenge. So, on July 13, 2013, joined by activists from around the country, we kicked off #ShutDownWWP with a protest outside the home of the company’s secretary and treasurer, Block’s 93-year-old mom. A still from Last Chance for Animals’ lab investigation of a Worldwide Primates customer. Matt Block was a married man when the #ShutDownWWP campaign took off. So we knew we were onto something good when we caught wind of his extramarital affair with local realtor Yvonne Sanandres and found his BMW parked in her driveway. It was the kind of thing the producers of Maury would’ve drooled over. Immediately following our exposure of the affair and with protests impending, Yvonne petitioned the court for restraining orders against Smash activists—to no avail. The secret was out, and after 26 years of marriage, Matt and his wife Brooke filed for divorce. The best part? Brooke wasn’t some third party with abysmal taste in men—she was President of Worldwide Primates! Needless to say, the Block family had seen better days. The #ShutDownWWP campaign hasn’t been without its setbacks, and never was that more clear than on October 30, 2013. 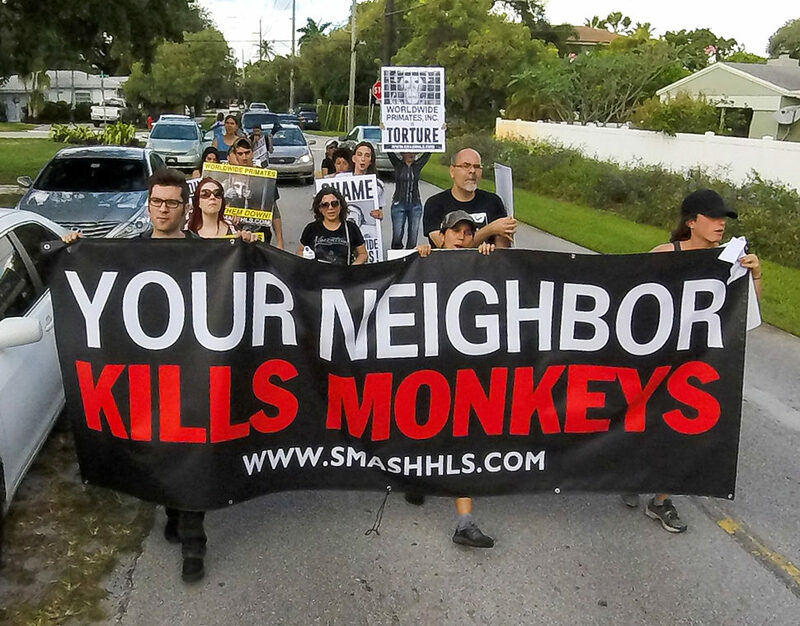 During a protest at the entrance of WWP’s outdoor breeding farm in rural southwest Miami—a prison for hundreds of macaques, squirrel monkeys, baboons, and marmosets—two men in a company van began to exit the property. As the electric gate opened, we formed a spontaneous barrier in front of the vehicle, momentarily preventing it from leaving. Then, instead of warning us to make way or waiting for us to disperse, the driver started to coast—then speed up—into the crowd. He weaved side to side recklessly, nearly pinning protesters against parked cars in the process. Frustrated and determined to stop the vehicle, some activists pounded on it, others threw rocks, another ripped off a sideview mirror. One protester even ended up on the moving van’s hood and narrowly avoided being crushed as it accelerated down the street. All the while, the driver and passenger laughed like ten-year-olds engrossed in a round of Grand Theft Auto. 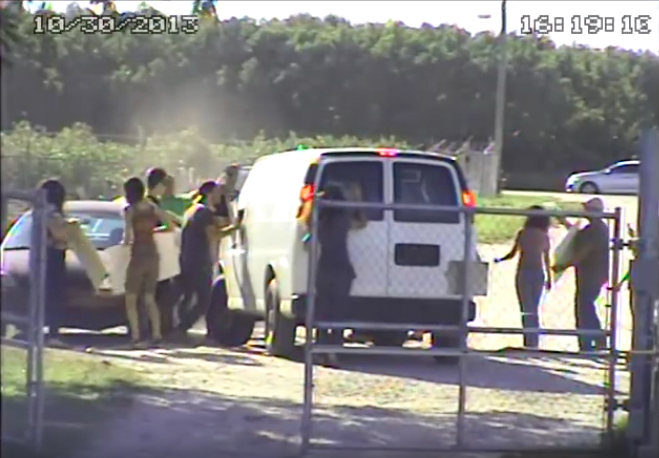 October 30, 2013: Nine activists were arrested in rural Miami after a WWP van with an undercover cop inside sped up into a line of Smash HLS protesters. But this wasn’t just a couple rogue employees letting off steam; it was a sting operation orchestrated by Worldwide Primates, the Florida Department of Law Enforcement, Homeland Security, and Miami-Dade PD. In fact, the man in the passenger seat of the van that was swerving into protesters was an undercover state trooper. Eventually, unmarked police cars sped from an adjacent field along with plainclothes officers who leapt from their hiding spots to swarm us with guns drawn and handcuffs at the ready. They quickly tallied $4,600 in damage to the van and arrested nine protesters on charges ranging from disorderly conduct to launching a deadly missile. Worst of all, the charges were accompanied by draconian stay-away orders that prevented those arrested from so much as encouraging others to contact anyone affiliated with the company. It seemed that Worldwide Primates, in a textbook case of collusion with law enforcement, might have finally gotten its way. Smash HLS had been through the wringer. We’d felt the cold sting of police repression firsthand—how a grassroots movement once brimming with enthusiasm could so easily become bogged down by legal fees, anxiety, and dejection. Nevertheless, emboldened by solidarity from supporters at home and abroad, we persisted. The charges against all but one of the defendants would eventually get dropped, and in the meantime activists unfettered by injunctions kept the heat on WWP and the Block family. Displeased with our continued protests and expiring restraining orders, Block turned to his lawyers. In March 2014, Worldwide Primates filed suit against 34 defendants, including Smash’s core organizers, fictitious Facebook personas, and everyone in between. The 302-page document sought permanent injunctive relief from Smash HLS, claiming emotional distress and monetary damages in the thousands and repeatedly referring to the group as a vigilante terrorist organization. It was a strategic lawsuit against public participation, or SLAPP, a common legal tactic used against people who engage in activism against a corporate entity. The fact that it was riddled with falsehoods and read like a drunkenly scrawled book report didn’t matter; in true SLAPP form, the idea was to drain our time and resources, to inconvenience us into submission. But we had help. Represented by a team of top-notch civil rights attorneys who took on the case pro bono, Smash HLS defeated the lawsuit in all its iterations. Just like Matt Block’s white powder ruse—which later cost him nearly $15,000 and another felony conviction—the lawsuit was all for naught. Smash HLS protesters march through Matt Block’s neighborhood. We used the 2013 arrests and subsequent lawsuit to our advantage, garnering media attention on the Block family’s bloody business and our campaign against it with every new courtroom development. We took heart at the shows of support from people around the world—and at the thousands upon thousands of dollars WWP spent on lawyers and revamped security. Our fight for liberation waged on. Having pushed all the buttons that we knew about, we set out to find more. So we researched. A lot. Countless hours of internet probing and in-field reconnaissance later, the #ShutDownWWP campaign was recharged with all sorts of new facets. For one, we outed the company that provided specialized refrigeration for WWP. Next, we lambasted the bank that loaned $4 million to Worldwide in 2016—its own mini-campaign with home protests and all. We also helped launch the Break Frame’s campaign with fellow activists in the northeast, which targeted one of WWP’s go-to trucking companies in Pennsylvania. And when activists learned that Block’s daughter was dabbling in the monkey business, they snuck into her apartment building to leaflet the halls. All along the way, we’ve continued applying pressure to the company’s customers and employees. One WWP associate is rumored to have fled the country after a surprise visit from Smash in January 2018. And recently activists celebrated the birthday of Matt Block’s son, Ira, with a raucous rally outside of his home. The results-oriented model of activism that Smash HLS adapted from its predecessors has proven immensely effective through the years. What began as a few dissatisfied individuals has grown strong enough to disrupt the supply and transportation infrastructure underpinning an entire industry. So now what? What does the future of #ShutDownWWP look like? It depends. While organizing against government-backed corporations comes with its consequences, repression from the state isn’t our only obstacle. The fate of both Smash HLS and the animal liberation movement as a whole primarily hinges on our ability to overcome bad ideas. An honest look will reveal that animal activism in the US has in recent years devolved into a capital-driven dogma of vegan recipes, feel-good platitudes, symbolic gestures, and celebrity praise. Increasingly plagued by a culture of passivity and at the whim of ever-diminishing attention spans, the fight for liberation has lost its teeth. But we refuse to see animal liberation as a movement whose heyday came and went. There’s still hope. We can bring captive nonhumans closer to the freedom they deserve by adopting the tactics that empower us and ditching the ones that hold us back. Through persistent, strategic campaigning—and with an eye for targets that are both vulnerable enough to be beat and substantial enough to be worthwhile—we can make history again. We can turn the timid murmurings of our weakened movement into a crescendo, one powerful enough to rumble and shatter the foundations that uphold systematic animal exploitation. With fervor and clear minds, we can make places like Worldwide Primates a nightmare of the past. For the animals, we have to.